Christmas is a fun time of the year. Snow, presents, and parties abound in the season. However, if all the modern decorations are not tickling your fancy, there is a way to really get into the Christmas spirit. However, never fear, because there are ways to channel the past into your Christmas. For example, use an old scale to hold extra ornaments. The scale in the example has a large wire basket on top of the scale itself that is holding all the ornaments. It’s incredibly cool, and the different idea will offer you an interesting and unique way of showing off ornaments that your tree simply cannot hold anymore. If you have a favorite ornament, put it on top or where it will be seen through the wires. A rotating color wheel is another retro touch you can add to the home. These were used to illuminate the tree in different colors instead of using lights on the tree themselves. The trees were often in different and unorthodox colors, hence why the trees wanted to be lit up in different colors. If your family is a fan of the classic animated Christmas movies, Grinch Pills are a fun way to offer little mementos for guests at a retro party. The example above also has templates you can print out and put around green apple Tic Tac containers. A fun poem is put on the front of the fun container that reads “Feeling kinda grouchy? Holiday spirit can’t be found? Just try these little ‘Grinch Pills’. They’re the best medicine around. Whether eating a whole handful or munching one or two, these tasty little ‘pills’ take the ‘Grinch’ right out of you!” Fun, right? If you have old style coffee creamers or old style syrup dispensers, use them to create a fun decoration for the table or a side table. You can fill them with Scrabble tiles (after all, it’s a classic game), or with jingle bells. Even a small Christmas tree can be used to create this fun decoration. With red and green lids, they offer a fun touch to the holiday season. The size honestly doesn’t matter, since they will create a fun and different idea for the decorations. Speaking of Scrabble tiles, yardstick ornaments offer a fun way to add a small retro touch to the tree. Simply take an old yardstick you don’t use or that are leftover, and hot glue Scrabble tiles onto the piece. Wrap and glue ribbon on to let them hang on the tree. If you want to, add plastic snowflakes with glitter onto the ornament. Finally, do you remember those lawn bowling sets? If you don’t use them, make them into decorations! They are certainly a throw back to the olden days, and can easily be painted to look like anything. The example shows penguins, but they can be anything – Santa, Mrs. Clause, elves, etc. 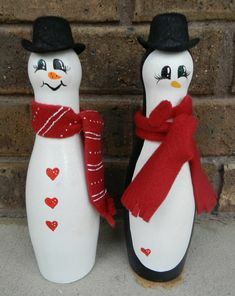 Even better, play Christmas bowling! No matter how you decorate, a retro Christmas is close at hand.